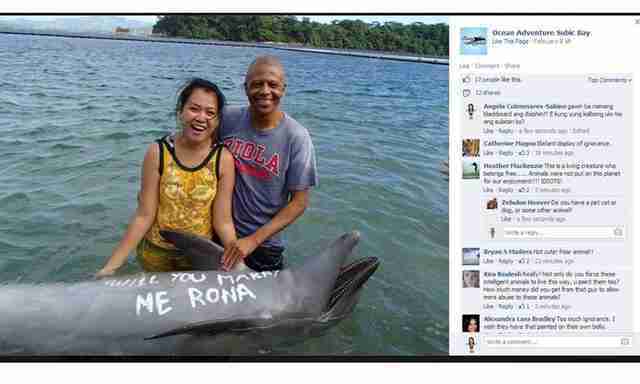 A marine park in the Philippines has drawn ire online after an image was posted to its Facebook page showing a couple posing with a dolphin that had apparently been used to assist in a wedding proposal. Ocean Adventure park has since removed the photo of the dolphin with the words "Will you marry me Rona?" painted on its belly, but only after the aforementioned outrage from followers around the world. "Really? Not only do you force these intelligent animals to live this way, u paint them too?" wrote one user. "How much money did you get from that guy to allow more abuse to those animals?" But such blatant exploitation of dolphins can also be found much closer to home. Unlike some marine parks where cetaceans are made to perform tricks for entertainment, Discovery Cove in Orlando, Florida makes no claims of any educational value keeping dolphins in captivity. In fact, the SeaWorld-owned resort will pimp out their dolphins for as little as $129. "The perfect marriage proposal requires the perfect venue, right? And the same holds true for special birthdays, romantic anniversaries, and other notable celebrations. These milestones deserve a spectacular setting; a setting so unique that the event is transformed into a lifelong memory," reads the Discovery Cove website. 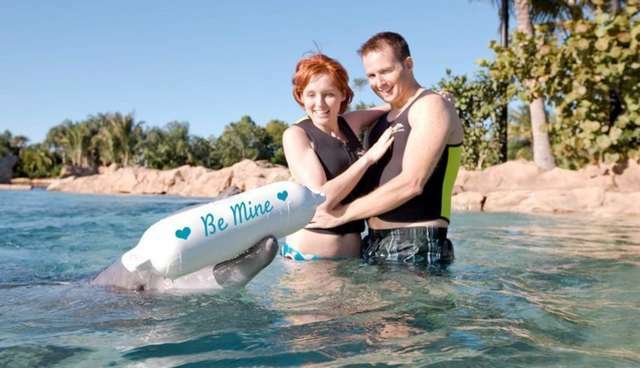 "At Discovery Cove, playful bottlenose dolphins can be part of your marriage proposal, deliver a unique birthday greeting or even a congratulatory message for the special someone in your life." Paying guests can arrange to have a dolphin serve as their personal courier, delivering a buoy with a customized message -- perhaps the most blatant example of animal exploitation found in SeaWorld's parks. Behind this fanciful, memory-making opportunity lies a sad reality. According to the Oceanic Preservation Society, dolphins in captivity live staggeringly short lives. At SeaWorld San Antonio, the average captive dolphin lives just four years, compared to between 40 and 50 years in the wild. The psychological toll on dolphins is far more difficult to measure, but for such high-intelligent animals adapted to life in the open ocean, being forced to interact with people in artificial pools seems quite clearly damaging. What's more, the use of dolphins for such shallow, gimmicky purposes undermines a healthy outlook on them as creatures worthy of protection from people who might take their lives -- in both the violent literal and aching figurative sense.